Today I went to a friend's house for coffee. At one point during the conversation she pulled her diary out of her bag--imagine my surprise and delight when I saw it's the exact Paperblanks day-per-page diary I featured here and gave away!! It was exactly the same size and cover. I love seeing diaries in use "in the wild," which for some reason doesn't happen all that often for me. I'm so curious to know how other people use their diaries. Seeing her use her day-per-page diary got me thinking about trying again with mine, but this time my Pocket size daily Moleskine (which is very portable yet has a big enough page size for all my daily details). I am a day per pager and I write my DAILY lists right on the page of they day they need to be accomplished. Longer term lists go in a separate section of my planner (currently a Pocket Filofax & this is working out quite well). Living in a small town and being a SAHM mom doesn't afford me opportunities to see planners in the wild. Would love to though! Needless to say, I'm always carrying and using my FC out and about, even at the grocery store for my shopping list and coupons, but sadly, no one seems to be interested enough to break into conversation about it :-( I feel all alone where I live! That's why I so value your blog, Laurie! Thank you!!! Initial thoughts on the Planner Pad. Paper is extremely thick, amazing, no bleed through from my fountain pen. Love the week in front of me. Like Filo allows you to put whatever you want as weekly list headings, like "To Contact", "Meetings", "In Progress", etc. Monthly calendar are "blocks" that can be easily written in. 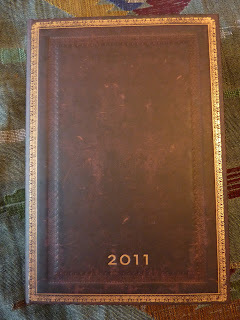 Planning pages for the next two years after 2011! I will write more as I use it, but so far it seems wonderful! Great to hear about the Planner Pad! I'll be really curious to hear how your usage of it evolves over time. I use a day per page Moleskine which I divide into 3 sections. My main to-do list is in the top section of my dated daily page. This is where I jot down the things I want to get done that day. I check them off as I get them done. If I don't get them done I put an X instead. If I ultimately decide not to do that item, I cross it off completely. This way I know what I got done that day & what needs to be carried over to another day. The Moleskine also comes with a separate thin notebook with cut out tabs. I think this is meant to be used as an address book. I've cut the tab part off to make it skinnier and use it as my "someday" list. This is stuff I want to get done some time in the future but has no set date-- house organizing projects and such. I don't look at this list very often, just from time to time. I've also recently started using an index card along with my daily to-do list in my daily page-- as kind of a "capture" device. Here I jot down stuff that I want to get done in the immediate future (about within a week) but doesn't have to be done on any particular day. This stuff has mostly to do with hobbies, quick projects, trying new recipes, or stopping by a store to pick something up. I find it easier to use an index card-- that way I can just whip it out, cross thing off, be as messy as i want, throw it away when I'm done. Laura I like your system! Great idea to use the booklet in the back as your long-term list. I use a sticky note inside the front cover of my book for my list that needs to get done sometime in the next several days but not on any particular day, which is handy. I can refer to it easily, and I don't have to re-write undone tasks day to day. That Moleskine paper "booklet" kinda stumped me at first, didn't know what I was gonna do with it. Using it to hold my "master" or long term list seemed like the best solution (I write, knit & crochet so have many long term projects i want to get to "someday"). I cut the tabs off to make it skinnier in order to make it fit in my Franklin Covey cover. The booklet now fits neatly into the back pocket. Using a sticky note or index card as a capture tool is a great idea. You can write things down as they occur to you, & like you point out, it saves having to re-write undone tasks day to day. It then becomes a running list that can be changed on the fly w/o messing up your planner pages. Someone can even DATE each card/sticky note to designate a certain week... as in, "This is the stuff I have to get done this week." 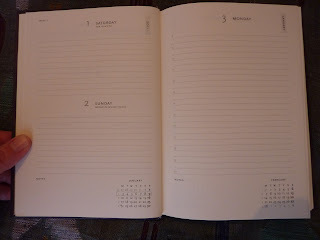 Then each task can be transcribed into the daily planner page, to be done that particular day, if desired. If anyone is interested, there is a lot written on the internet about using index cards & sticky notes in time management/personal organization. Using a "capture device" is big in the "Getting Things Done" subculture. Two-month checkup: what are you currently using? Lost Filofax pages drive me crazy!